At least in their home country Norway, there's no one interested in the darker shades of metal who hasn't heard about Kråke. The relatively new band (founded in 2007) has achieved a good deal of touring in the year that has been, spreading their melodic folk inspired black metal. Mind you, we're not talking about a black metal band in a million. I've heard quite a bunch of them before, and Kråke's not like that. 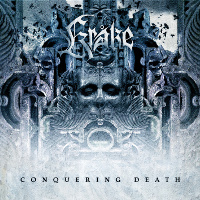 Their first album Conquering Death gathers inspiration from folk rhythms, sleazy greasy headbanging metal and good old black metal in a unique symphonic combination. The compositions are self-sustained; still great names like Immortal, I, Windir, Emperor come to mind. I have strong faith in Kråke, let's rejoice over conquering the death of black metal at last!